This satisfyingly thick volume is the first fishing manual that Medlar has ever produced, unless I have missed something. Or is it a fishing manual? Complete, this book definitely is, although it lacks any references to our own Vernon from Waterlog, requiscat in pace. 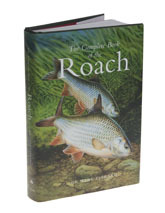 The Complete Book of the Roach impresses with its weight – drop it and it lands with a thud. When you pick it up, the overwhelming impression is that once read, you will have very little need to learn any more about roach and, having worked through all four hundred odd pages, I can assure you that first impression is correct. Mark has a Ph.D in aquatic biology and has a 3 lb 6 oz 4 dr roach to his name, having held the Bristol Avon river record for no less than seven different species, so he knows of what he speaks. Being a Medlar book, instead of being instantly plunged into the world of specialist tackle and wonder-bait, the first 120 pages deal with roach biology, while the last 50 look at roach and society, a subject which had never occurred to me might fill eight chapters. In between, you get a definitive text on how to catch roach, with plenty of illustrations and flashes of humour. In the final analysis, The Complete Book of the Roach gives me the wish to fish and you can’t say fairer than that.